The weather was unseasonably warm yesterday, so I decided to drive out to a local park in case the sunset was interesting. It wasn’t at first. I shot for awhile, but saw none of the pinks or reds I was hoping for. I waited a full 15 minutes after sunset, and still all I had was blues and grays. I removed the camera from the tripod, collapsed the tripod, and prepared to walk back to the car. Then I saw, through the trees on the southern horizon a little bit of pinkish clouds. Sure enough, there was some pink in a cloud to the north as well, color that hadn’t been there a minute before. I decided to wait for a minute….and quickly the sky to the west began to colorize alarmingly quickly. I set back up and shot like crazy for the 5 minutes or so it lasted. I already knew this as a guiding principle – you need to wait for awhile after sunset to see what develops. It was just that this time it really looked like nothing would happen. Wrong! Patience pays off in situations like this, don’t pack up too quickly. Something else that is illustrated by this image is that it is possible to shoot something like this in an urban setting. The windmill is set on a small hill, which I used to block the biking path, lake, road, cars, joggers, and tall light poles beyond. Not that there’s anything wrong with those subjects, but that was not what I was after this evening. All that matters is what is in the frame. This is a three exposure HDR, hopefully not overcooked. The only thing I could have wished different was that the bladed wheel at the top of the windmill was turned more in profile. I tried my telekinetic powers, but the thing wouldn’t budge. You can’t have everything. This entry was posted on February 24, 2012 by Charles Ford. 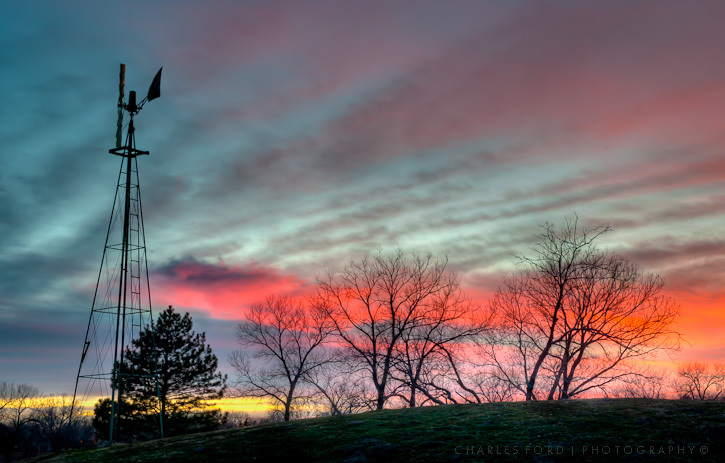 It was filed under HDR and was tagged with Dusk, HDR, Photography, Sky, Sunset, Wichita, Windmill. Windmill blades aside, this is one fantastic photo and not at all overcooked. The trees and cloud pattern seem aligned. Our days have been overcast, rainy and gloomy for weeks now and it’s nice to see photos like this. It’s 34 degrees now with freezing drizzle so I’ll not see the sunset today either. I also thing that the trees look better without their leaves in a photo like this. Like they are reaching up. Well thank you Ken. Sorry about your skies.